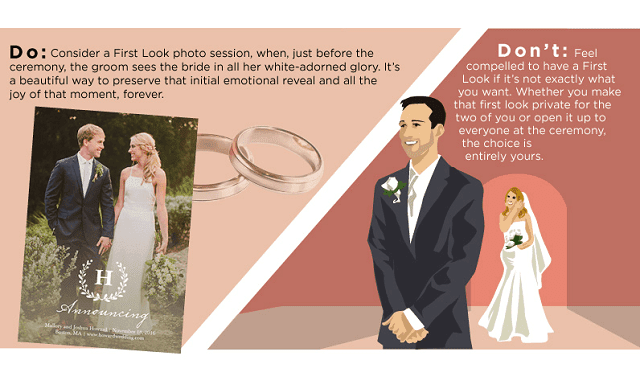 Wedding Photography Do's and Don'ts #infographic ~ Visualistan '+g+"
When it’s time to solidify your relationship, photos are a great way to commemorate the romance. Whether they’re engagement photos, or pictures of the big day (your wedding day), you should feel confident about the poses, and the overall feel of the images. One great way to get ideas of how to pose is to look at other wedding photos. Pay attention to the posture of the bride and groom, and look closely at their backgrounds. Analyzing other photos can give you a general idea of what you do or don’t want your pictures to look like. Be involved in the creative process, and use some of your own ideas as props or poses. Plan to capture moments from the guests too, not just of you and your spouse. You’ll want a few staged images, as well as some natural ones. Your photographer should be able to give you some helpful advice and tips on posing, and how to get the look that you’re after. Just remember to act as natural as possible, and never look directly at the camera unless the photographer asks you too.